Thanks for contacting ASRock America. Please understand that open-box product / bent pins is not including in manufacturer warranty. Please contact Newegg to get further assistance if you need return or replacement. If you prefer to do RMA with us, ASRock will charge $50 labor & service fee (Non-US customers need to indicate the check or money order will be paid in U.S dollar.) and provide 3 months warranty for the replaced motherboard. We only accept check or money order. If you decide RMA your motherboard with us, Please complete the attached RMA request form, and then e-mail it back to obtain RMA number and shipping instruction. Any packages received without an RMA number outside of the package or valid RMA number will be rejected and returned by your own expense. -You must complete all required fields, or you might be delayed to obtain your RMA #. Nope..didn't think I would get a replacement.. Acknowledging the problem and honoring their warranty would probably bankrupt a company like that, the problem is widespread and not limited to one model. I only trust Asus and Gigabyte boards these days, even MSI acted just like Asrock when I had a problem with one of their boards (ignored my emails and RMA request after the first response). Asrock, ECS, and Biostar have always been risky. Intel and EVGA make good boards but they generally have a crappy BIOS and software, although EVGA is recently showing signs of improvement. I've been very satisfied with several Asus boards, so I generally stick with them, and most people agree that they write the best UEFI BIOS in the business. Hood wrote: Acknowledging the problem and honoring their warranty would probably bankrupt a company like that, the problem is widespread and not limited to one model. 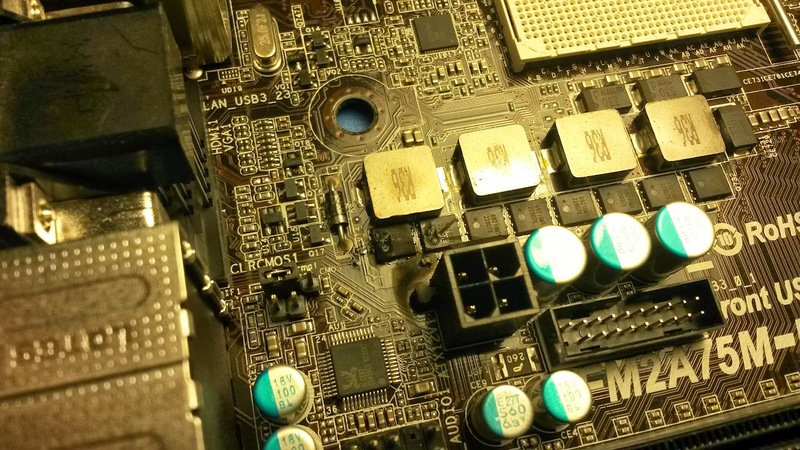 I only trust Asus and Gigabyte boards these days, even MSI acted just like Asrock when I had a problem with one of their boards (ignored my emails and RMA request after the first response). Asrock, ECS, and Biostar have always been risky. Intel and EVGA make good boards but they generally have a crappy BIOS and software, although EVGA is recently showing signs of improvement. I've been very satisfied with several Asus boards, so I generally stick with them, and most people agree that they write the best UEFI BIOS in the business. Last I heard it looked like ASUS may take over ASRock by either buying it or combining forces. Cant remember if ASRock was started by ASUS people who left or by ASUS themselves and then they broke up the company...I dunno, it is so damn murky the information you can find but somehow they were at least related before and now they want the child to come back home i guess. I read that this board had issues but didn't they were catching on fire. I email customer service for an RMA sent a picture to show them its the same ICs everyone was blowing and got this response. Based on the picture you send it looks like a physical damage and the cost to replace it will be $50. ROFLMAO - and NOW you know why I will never buy an ASRock product in my life and why I am trying so hard to get everyone else to realize this company has the worst products and customer service in history. Their products are perfect and you must have taken a blowtorch to that motherboard or messed with it somehow because ASRock products are made by God and never have problems. Yea, ASRock can kiss my ASRock. Not letting my campaign against horrible quality control and even worse customer service go. I wish every person who had any influence in the industry would tell them to go to hell unless they change their practices. From this thread and MULTIPLE posts all over the internet, I am not alone in what has happened. Isolated incident, I can understand. Multiple incindents, no excuse for how ASRock has acted towards EVERYONE. It was not OUR fault, it was YOURS and you would not admit it nor fix it without charging good customers even more money for what was faulty in the first place.